You Are The Roots: and that's a wrap on the green day. St. Patrick's Day has come and gone. It isn't that I hold some kind of sentimentality towards the holiday, it's just that I love celebrating the holidays with Ethan. Any holiday, big or small, new or old, commercialized or not. I'd already complained how grinch-like I felt having pushed St. Patrick's Day to the back burner due to an untimely back injury, but once we kicked things off with a green bread baking marathon, I'd gotten my festive spirit back. And it's a good thing, because we had a lot of fun on this very green day. This morning, we went to the farmer's market and picked out a green pepper to make shamrocks with. 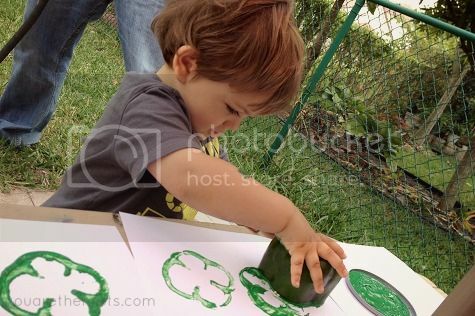 All you need is green paint, a horizontally-sliced green pepper and some paper -- shamrock stamping galore! 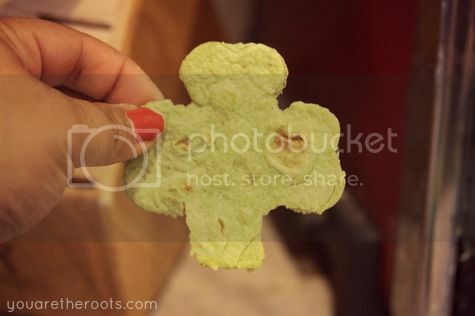 Using a shamrock shaped cookie cutter, I made shamrocks from a spinach (and thus green) tortilla. The same way you make homemade tortilla chips, I basted the shamrocks with olive oil and baked them at 320 degrees for 10 minutes. 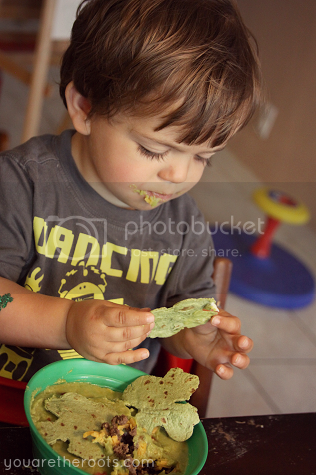 Ethan was pleased, even if the shamrock tortillas didn't end up being as cute as I'd planned in my mind. After dinner, we made the trip to our favorite dessert place (shout-out to Cecilie's Italian Ices in Coral Springs, Florida!) 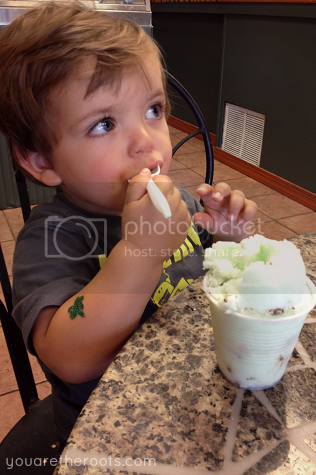 for some green Italian ice. 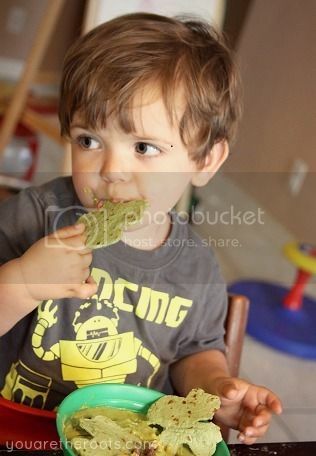 Ethan had mint chip. And because no color-themed day can be complete without a green bath, we finished off the night with a green Lush bath. I'm silently high-fiving myself for having added some sort of relevant St. Patrick's Day joy and fun to this day, considering I'd felt a little preoccupied prior to the holiday. 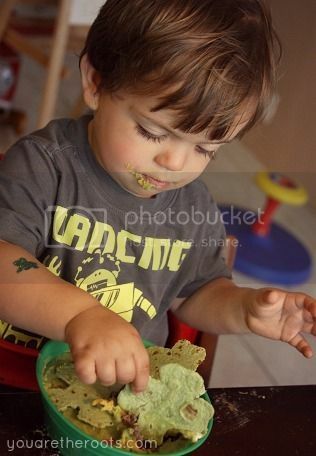 I hope everyone had a wonderful green day with their families -- if maybe a little more authentically Irish than our own! OMG you are too cute! 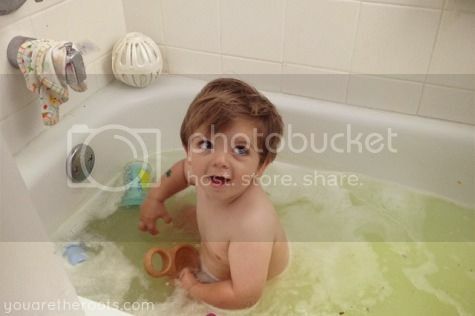 I love the green bath idea, my niece and nephew would love that! I hope you have a wonderful week! Stopping by from the GFC hop...what a cute day!! I love everything. The green bath is so fun. I'll have to remember the pepper stamps for next year. Happy Monday! What a great day! I love the shamrock tortillas. I will have to remember that for next year. 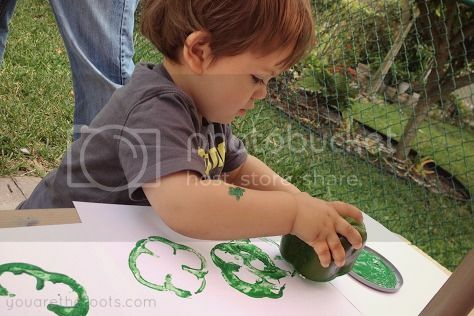 Love all the green FUN! I am craving those tortillas this morning.